Murder by Gaslight: Murdered his Mother. Elmer Sharkey, still wearing his night clothes, ran to his neighbor’s house, the morning of Saturday, January 11, 1889, calling for help. His house had been broken into and his mother had been murdered in her bed. Elmer, distraught over the death of his widowed mother, Caroline Sharkey, persuaded county officials in Eaton, Ohio, to offer a reward of $1,000 for the apprehension of her killer. As soon as the reward was announced, Herman Hughes, a well-known young man of Eaton, had himself appointed special officer, and put Elmer Sharkey under arrest for the murder. Sharkey denied the charge and remained stolid until after his mother’s funeral the following Monday, when he finally broke down. Hughes had a talk with him after the funeral and Sharkey confessed to killing his mother, though he had not remembered the details until after her burial. Elmer Sharkey, 22 years of age, had been at odds with his mother over his love for Katie Straw, a neighbor girl. Mrs. Sharkey was adamantly opposed to the match, and mother and son would alternate between violent argument and long periods of silence. 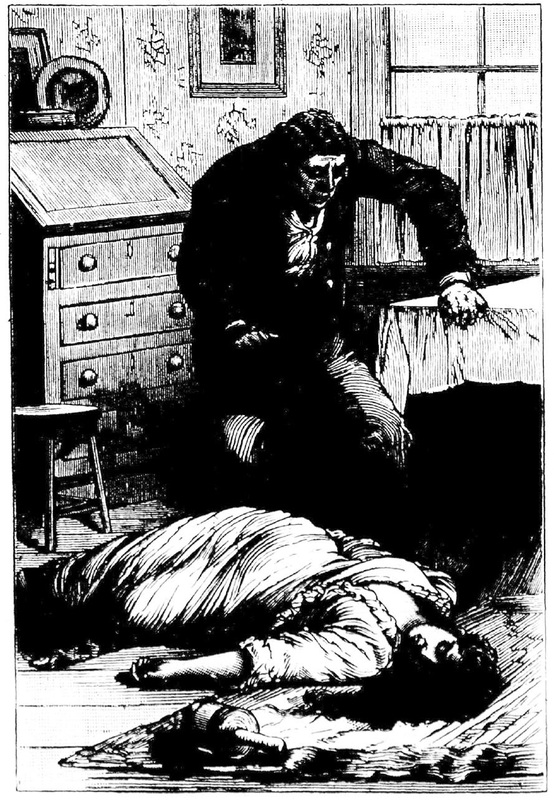 The night before the murder, Sharkey declared his intention to marry Miss Straw. Caroline Sharkey then announced her intention of changing her will the following day and disinheriting him. As he lay awake, pondering the matter, Sharkey came to the conclusion that the only way he could keep the family farm was to murder his mother before she changed her will. Without dressing, he went out into the yard where he had been chopping wood and came back with a huge wooden maul he had been using to split logs. He entered the room where she was sleeping and with one blow he crushed her skull, killing her instantly. A second blow broke her arm. Then he dragged her to the floor and disturbed her clothing to suggest a struggle had taken place. He smashed a window and went upstairs and smashed out a panel on his bedroom door. Then without going back downstairs, he left the room by hanging from the window sill, then dropping to the ground. He cut his hands and face with broken glass and ran to the neighbor for help. At his trial, Elmer Sharkey pled not guilty by reason of insanity. He had not recalled the events of the murder until days later, and his attorneys brought out histories of mental illness on both sides of his family. But the jury was unconvinced and found Sharkey guilty of first-degree murder. The case was appealed and a new trial, in a different venue, was granted. His defense continued on the same lines in the second trial, presenting a long litany of family members who had served time in an asylum, suffered epileptic fits, or had attempted suicide—including Sharkey’s mother and two sisters. The jury could not get past the image of Elmer Sharkey smashing his mother’s skull with a maul, and found him, once again, guilty of first-degree murder. "A Young Fiend." Cleveland Leader 15 Jan 1889. "Found Guilty of Murder." Repository 3 May 1889. "Her Skull Crushed." National Police Gazette 2 Feb 1889. "Horrible Confession." Morning Star 16 Jan 1889. "Killed By Her Son." Plain Dealer 15 Jan 1889. "The story of his terrible crime." Morning Star 12 Mar 1890. "Two Murderers Hanged.." Daily Inter Ocean 19 Dec 1890.